So I’ve not written a review in a long long time, apologies! Genuinely, does everyone still find my reviews interesting or at least inspirational? I received this ‘Cute Animal stamping plate‘ from BornPrettyStore and there are some seriously cute patterns to use. A lot of them are ‘stamp and go’ meaning there’s no need to faff about with reverse stamping and the likes so it’s perfect for pros and beginners alike. Being a bit of a dinosaur fan, it was an easy call as to which image I was going to use first. I created a very simple background, using scrunched up tinfoil to dab polish on to the green base and started to stamp with the dinosaur image. It only took two practice pick-ups for the plate to warm-up (it’s kind of like breaking in new shoes), meaning what you see below is the third: how crisp is that! Granted, I was using Konad stamping polish meaning it’s highly pigmented but still pretty impressive especially the dinos tails, spikes and horns. The next image I chose to use on the plate was one that I could use create a stamping decal with. The rabbits seemed pretty fun, and I like the addition of the broccoli and carrots – cute! Some of the finer lines on the rabbits faces were a little trickier to pick up but nothing too noticeable once it’s on the nail. Pretty cute huh? This is another example of a BornPrettyStore plate that’s suitable for a variety of themes/holidays. For example rabbits for easter, penguins for winter, hedgehogs for autumn and bats for Halloween. The last design I created was again a quick stamp and go one, featuring some giraffes. Now on the plate the giraffes are actually part of a pattern, but I chose to discard the surplus animals leaving one on the stamping head at a time. Just because an image is etched in a certain way doesn’t mean you need to use it as such! If you feel like trying this plate out for yourself, remember to use my code ‘AZYW10’ to receive 10% off any full priced items in your order. The plate is currently (31/7) half price and BornPrettyStore does free shipping so why not go for it! So I am seriously in love with this plate! (Sent to me by BornPrettyStore) Please tell me that you guys are too? It has such a variety of cute images and they’re so darn versatile – you could honestly use it for any mood or season. It has it all; flowers, hearts, animals, patterns. Because of the variety of images and endless designs that could be created by using all the different stamping techniques too, I spent a few days creating four completely different looks with it. I’m really digging bees at the moment so the origami image of one was irresistible. I decided to do some ‘reverse stamping’ with it and pair it with an origami tulip. I used one of the patterns from the clouds as a subtle background. As you can see the plate performed incredibly well – the images are very crisp and even without a stamping polish, the background pattern worked too. A cute and simple design to start off with! Even though the plate is full of origami designs, I chose to avoid them for my next mani. I picked out the little strings of hearts and dots and rather sickeningly paired them with red. It’s no where near valentines day which is maybe why it made me feel so sick but it was to demonstrate that you can use the images for any occasion. Again credit where credit’s due the images are crisp and bold. This time they are stamped with black Konad stamping polish. The next image I chose to focus on was the origami star. If you look at the plate, it’s very close to the sting ray and frog so I wonder if it’s intended to be a starfish but I chose to use is an actual star. It would work either way! I kept it very simple, an easy ‘stamp and go’ design. Sometimes I feel, especially with stamping, people show you magical designs that aren’t in everyone’s skill range (or time frame). This is do-able for everyone! Linking back to the seasonality, this would be a suitable design for christmas or the new year? So out of all four designs, which one turned out to be your favourite? Surprisingly for me, my favourite turned out to be the rose design closely followed by the bee! 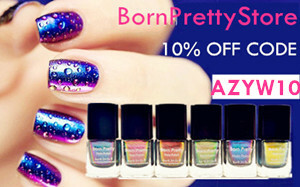 If you would like to try the plate out, BornPrettyStore offer free shipping and the plate is currently on sale – hooray! If you add anything to your basket that’s full priced, use my code ‘AZYW10’ at the checkout to receive 10% off. So today I tried out BornPrettyStore’s ‘Harunouta Stamping Plate L002‘, and boy is it a big one! It has over 36 images to use which is pretty darn impressive for one plate. How good does a new plate look! Immediately, and rather obviously, the idea came to do reverse stamping with the Kokeshi doll images so that’s what I did. The plate is smooth, the etchings are clear so I had no problem picking up the images. I decided to try again with the blossom image, but this time show a little versatility by creating a christmas design with a clearly not-so-christmassy plate! I again went with the reverse stamping/stamping decal technique. What do you think of my Poinsettia? Okay, so unfortunately the holes in the blossom still happened. Anyone any ideas as to why that happens? The plate looks really well etched and the kokeshi doll picked up just fine. I mean this is under major scrutiny, at a distance where any normal person would be looking at your nails it’s barely noticeable. There’s so many great, usable images on this plate that I could have painted tonnes of designs! I hope I’ve managed to show you a few ideas on how to use it, and possibly inspired you on how to turn non-christmas related images into something with festive cheer. If you fancy ordering the ‘Harunouta Stamping Plate L002‘ from BornPrettyStore, use my code AZYW10 to receive 10% off all full priced items in your basket and remember – free shipping! So I already own several BornPrettyStore stamping plates, as well some stampers/scrapers by them too, but today I have BP-80 Stamping Plate* to review! The plate includes some very pretty images and arrived in a little card pocket which is super handy if you don’t have a stamping plate holder as it will help protect the plate when not in use. As expected it comes with the protective blue film that all stamping plates seem to arrive with – for those new to stamping, and I’m not being patronising here, remember this needs to be removed before use. As you can see, the images are amazingly crisp and very well etched. I really couldn’t make my mind up as to what design I was going to feature, so I went a bit over-board. I used three different stamping techniques to create three different designs with four different images! For the first, I used the reverse stamping technique with the larger bird and large lotus. I chose to use my clear stamper because you can see if you’ve missed parts or messed up the image by looking ‘through’ it. The image does look a little patchy, but I wasn’t too worried seeing as I was painting over it. I didn’t really take the time to properly break the plate in, as daft as it might sound I sometimes find stamping images pick up better after the 3rd or 4th time. I managed to smudge some of the detail (eye and neck feathers) when I was filling the image in but I’m sure you get the idea. I also feel that my pink base was way too bright, I was aiming for subtle but instead it’s ended up as a bright pink punch in the face! Secondly, I chose to do a multi-coloured scrape. The one where you blob on a few colours and then scrape over it a few times so the colours all mix up. I thought the cloud(?) image was perfect for this as it had a large enough engraved area for the colours to show. I think this kind of look would be great as a base, however maybe if I’d placed the image properly and covered my nail you could use it as a ‘full’ design. The polishes I used were not stamping polishes but this allowed for some layering, you can notice this more on my ring finger and in future I’d like to play about with that some more. Last but not least I chose to use the doubling up technique; you stamp the same image in two different colours almost on top of each other. This has only really become possible with the clear stampers, otherwise it could look a little messy. I chose red and black purely because those were the two stamping polishes I had and the daisy-esk image. 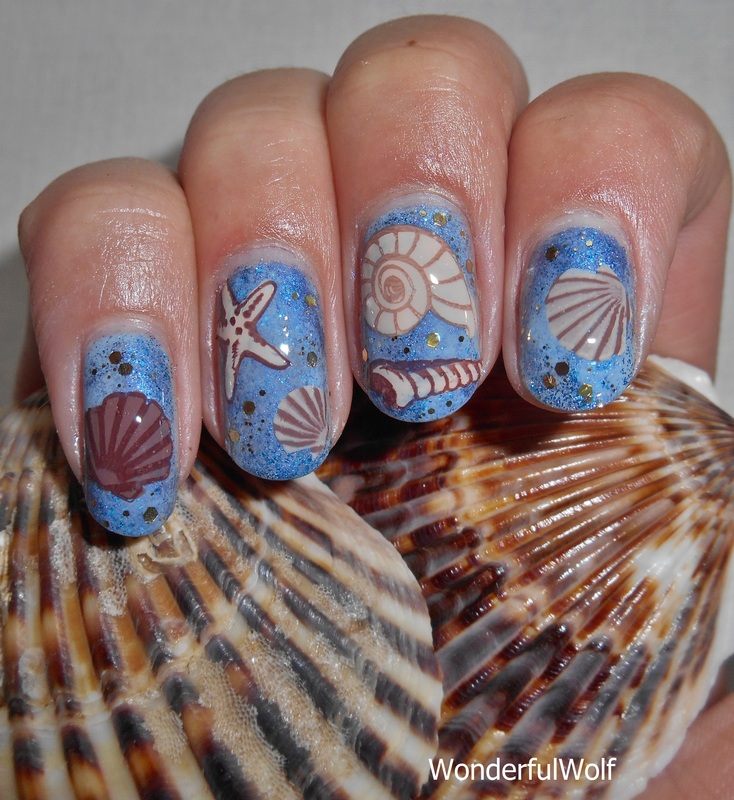 Stamping polishes certainly make a difference and as does a well etched plate – I mean look how crisp those edges are! The third picture looks way more vibrant, but that’s due to there being a top coat applied, for some reason the stamping polishes apply a little matte. I hope that’s provided plenty of inspiration to get you going. Let me know if you order this plate (or already have it) and what you’d do with it. Currently (13.05.2016) BornPrettyStore have BP-80 and a bunch of other stamping plates half price. If you add anything to your basket that happens to be full price, use my code ‘AZYW10’ at the checkout to get 10% off those items. Are you still reading? You shouldn’t be, you should be shopping! So as you may or may not know I am an avid fishkeeper, this also includes the odd freshwater shrimp (nothing fancy just your usual). At the weekend, Scotland’s very first shrimp show was held so it was obvious I had to attend. It was actually in conjunction with a fish tabletop sale – think of a car boot-sale inside, on tables, for everything aquatic. I actually picked up many a great bargain, but no fish as I was only in the market for tank decor, but anyway I’ve digressed. SHRIMP NAILS! Did anyone else eat those pink, foamy shrimps when they were younger? I swear that’s all I could smell whenever I looked at my thumbnail, it was so weird. I created these shrimps by using a hehe stamping plate, and using the ‘stamping decal/reverse stamping’ technique with my clear stamper from BornPrettyStore, it just makes it so much easier to see where you’re painting and where you’re placing. So what will you chose Neo? But seriously which do you prefer? Today was a day of experimenting with stamped decals. The plate itself is by he-he and also includes some Japanese fish flags, and babushkas. I used my three different stampers – left is a clear jelly stamper from BPS, middle a stamper from Poundland, and right is a rectangular mallow stamper from BPS – as I was curious to see if they would affect the results. I used my Konad Black to stamp and they all turned out with mainly the same transfer. They all picked up well and I’ve put the slight smudges that are visible on the pink and white stamper down to myself not scraping the plate properly. I then painted the backs of them with my white ‘nail paint’ (from my essential nails course) and a little bit of colour and then topcoated. Unforunately I managed to mess up my pink stamper by smudging it all over the joint so that cat was ‘put to sleep’ in a cotton pad of acetone. The clear stamper was excellent to use; I could see where I had potentially missed parts or unknowingly smudged bits as there’s nothing worse than turning over your freshly made decal after 5 minutes of waiting to see that you’ve smudged it and rendered it useless. Seeing as all the stampers technically worked, I wouldn’t throw any of them out. 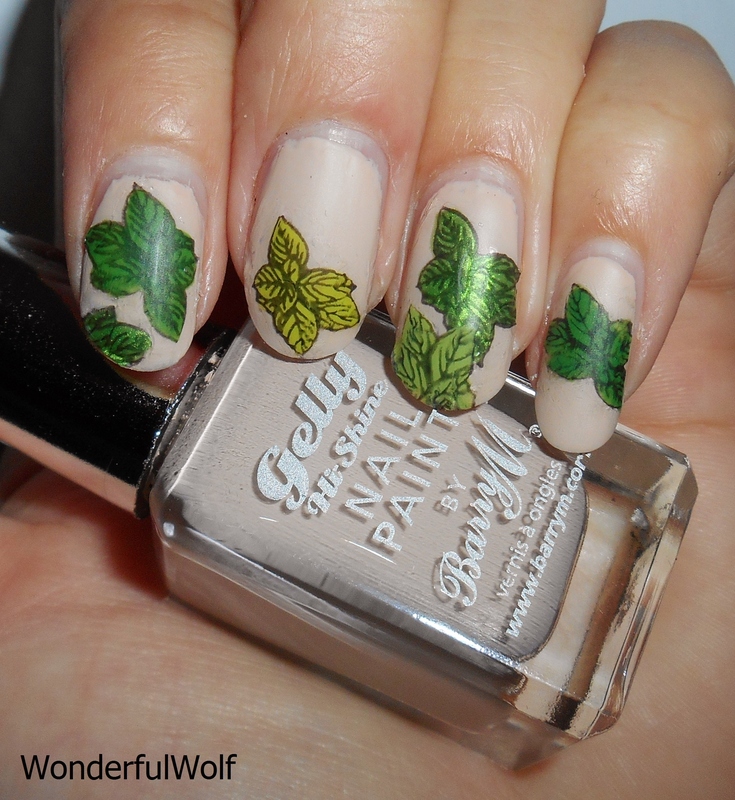 The mallow stamper is great for longer, full nail designs that some plates have. Whilst the clear stamper is the perfect tool for creating decals or layering stamping patterns over each other. The pink stamper comes in handy I suppose as an extra. As for red or blue? I personally prefer the blue cat. So do you ever get one of those designs where you think ‘if only hadn’t put that other shell on, or positioned it in a slightly different way’… This is exactly one of those design, the long trumpet shell on my middle finger is just wrong and it’s bugging me. I created a sponged base, then reverse stamped the shells, added individual specks of gold glitter using my thin brush and viola! And I really do love the design over all, I think it’s really pretty and I keep looking at it, but that trumpet shell…. So I used the reversed stamping technique for these, but if I’m being honest I just wasn’t in the mood. Therefore I wasn’t being patient or caring enough leading to some mangled leaves. I also didn’t pay attention to my positioning resulting in a lot of the leaves facing the same way. I’m sorry, as it did have the potential to be pretty but instead just looks like a limp salad.